General Contractor: The Bentley Co. The Grohmann Museum is home to the world most comprehensive art collection dedicated to the evolution of human work where visitors may view industrial manufacturing from the 18th century to the present. The renovated, three-story, 38,000-square-foot concrete structure was built in 1924 and the museum steel and glass-domed entrance welcomes visitors to three floors of gallery space filled with over 900 paintings and sculptures - a core collection is displayed as well as special themed exhibitions culled from the collection. 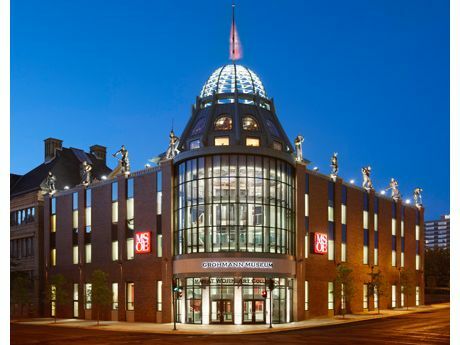 The facility was created to promote Milwaukee School of Engineering students' exposure to and appreciation of art and the museum includes general use classrooms as well as a conference center. The corner of Broadway and State Street in downtown Milwaukee is now famous for the museum's striking corner steel and glass cylindrical atrium - and its rooftop sculptures. And, the Man at Work Sculpture Garden atop the Grohmann Museum is more than an extension of the Man at Work art collection - it is an intensive greenroof. "A dozen large, bronze sculptures � men toiling in the field and foundry, heaving hammers or pinching molten metal with hot tongs � perch on the roof line of the Grohmann Museum. These fellows, each about 9 feet tall and weighing in at a thousand pounds a piece, have a commanding view of a city that was built on the hard work they depict. "The commissioned sculptures, replicas of smaller bronzes in the collection, were fabricated in the Philippines through a process called lost-foam casting that transformed them from their original size of about 19-inches to larger-than-life scale. The process involves sculpting the works out of polystyrene and then creating a casting, which employs a series of steps using wax, ceramic and molten bronze. In addition to the 12 large-scale works, another six sculptures are displayed in the 10,000 square-foot garden interior. The space is perfect place for enjoying sculpture, contemplation or entertaining," (Grohmann Museum). According to James Kieselburg, II, assistant director at the Grohmann Museum, the figures elebrate human industry� and include workers in agriculture, retail, intellectual trades like doctors and lawyers � even tax collectors. t is a collection unlike any other,� he pointed out. 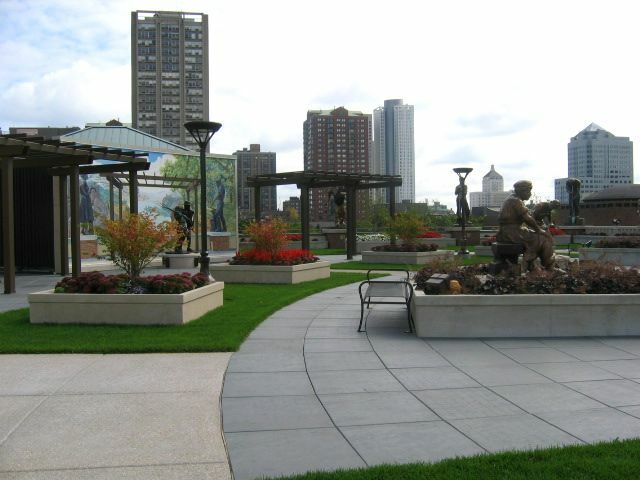 Completed in October 2007, the roof garden, which also features pavers, sod, and various planters in addition to the sculptures, is open to museum patrons and staff and is also used for special functions. "The roof has been in high demand since it opened," Kieselburg stated. It was important to find a waterproofing system for the green roof that could withstand all the foot traffic as well as support the 1,000 pound sculptures. The Sika Sarnafil loose-laid waterproofing system was determined to be the best candidate for the job. A two-ply vapor barrier was installed with tapered extruded polystyrene over it and an Electric Field Vector Mapping� (EFVM) foil-faced sheet system was then applied, grounded to the structure. The Sarnafil G476 membrane was loose-laid on top, followed by the vegetative cover and / or the pavers, which were installed on a pedestal system. Laid out on a radius pattern, it was very difficult to install, and securing the statues also posed a challenge. Another challenge was dealing with all the different trades that were on the roof at the same time - electricians, masons, landscapers, irrigation people - project coordination was key to protect the work. This was a complicated roof because of all the different flashing conditions and was challenging for both Sika Sarnafil and F.J.A. Christiansen Roofing Company. The roof has generated great interest for the museum and for the Milwaukee School of Engineering and people have been captivated by it. 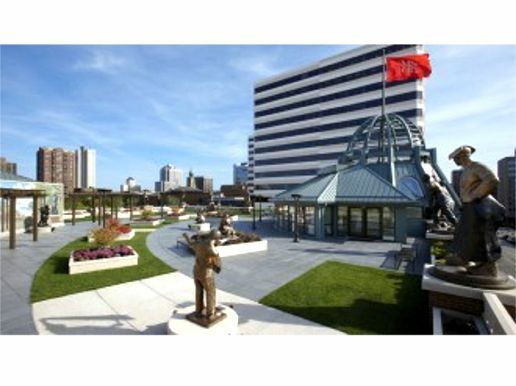 And, the sculptures themselves have a commanding view of the city of Milwaukee that was built on the hard work they depict. 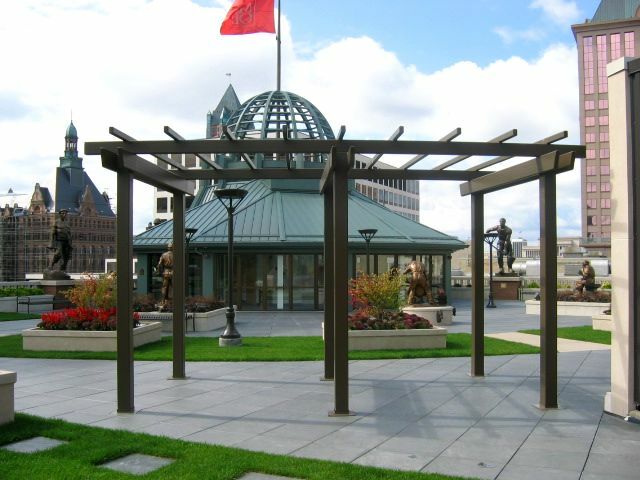 The Grohmann Museum is located at 1000 N Broadway, Milwaukee, WI 53202; 414.277.2300. 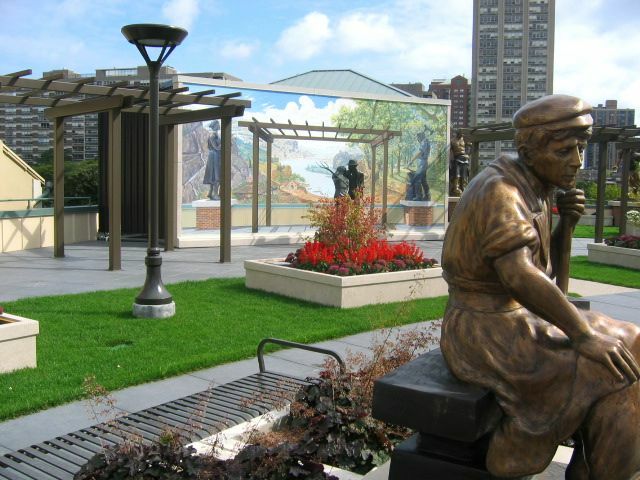 Visit the Grohmann Museumwebsite and specifically the Rooftop Sculpture Garden page; watch their 4:58 video Visit The Grohmann Museum - Milwaukee on YouTube. Watch the 2:01 video Man at Work Sculpture Garden at the Grohmann Museum - Project of the Week 5/19/14 from Greenroofs.com on the greenroofsTV channel on YouTube. See a beautiful photo gallery of the Grohmann Museum, including the Man at Work Collection, on flickriver by hanneorla and TripAdvisor. 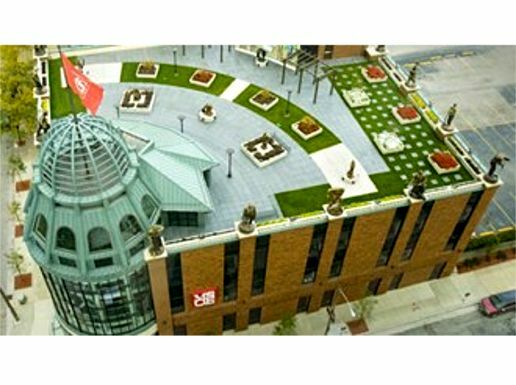 See the project profiles from Uihlein - Wilson Architects; F.J. A. Christiansen Roofing Company and Sika Sarnafil - visit their green roof page here.